Disappeared News: What Can Brazilian Prisons Teach Us? What Can Brazilian Prisons Teach Us? 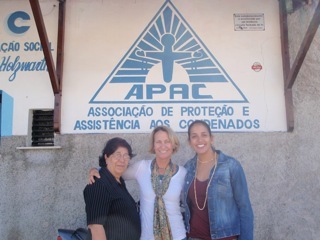 Lorenn Walker, JD, MPH recently returned from visiting prisons in Brazil. She even stayed overnight in a male prison. Except they do not call it a prison, nor do they call the inmates “prisoners”. Her talk was held at the Hawai`i Supreme Court where she was introduced by Elizabeth Kent (Hawai`i State Judiciary’s Center for Alternative Dispute Resolution). Lorenn used to be a Hawai`i Deputy Attorney General assigned to the state prison system. The inmates are called recuperandos (“people undergoing a process of recuperation”). They do not wear uniforms. There are no guards wandering around the facility. When a new person arrives, their shackles are taken off at the door. Emphasis is on socialization, communication, literacy, job training and rebuilding connections to families. The facilities practice Restorative Justice and are affiliated with the “Association for the Protection and Assistance of the Convicted” (APAC). Statistics are posted on the wall, including the number of people who wandered off, the number who came back on their own, the number who were brought back, and the recidivism rate. The typical recidivism rate is 4-10%. That is, 1 out of 10 or 20 released people return to crime in three years. This is similar to Hawaii’s rate in 1970. It is far better than Hawaii’s current rate: 50-62% and much better than Hawaii’s rate a few years ago when it was around 70%. Lorenn Walker described one facility: “It is more progressive that most drug treatment programs in the U.S.” The “prison” encouraged her to take picture inside the facility. It looked like a campus. Brazil is decentralized so a town or city must request that a facility be opened in their area. If a Judge recommends a convicted person to attend the facility, then a panel of current and former inmates reviews their record to determine the appropriateness of that person joining their facility. One major consideration is that the person should have connections to that community. Handicapped people are eligible. There is a waiting list. The facility has gardens, workshops with tools, a library, basketball courts, and other methods to keep people busy. Catholicism is part of the fabric of Brazilian culture. These facilities are Catholic based. There are examples of both faith-based and non-faith-based Restorative Justice in the U.S.
Chuck Colson (imprisoned for his role in Watergate) promotes Restorative Justice thru the Sycamore Tree Project. I (Henry Curtis) remember visiting the Danbury Federal Prison around 1975. The facility was a minimum security federal prison whose inmates included tax evaders, draft dodgers and a few drug dealers. The cell doors did not lock, guards within the prison did not carry weapons, and the inmates cooked for the guards. Thus the guards treated the prisoners with respect. Practically all inmates will return to society. In preparing for that day, should they be treated like dogs or people? Should they have job skills? Should they know how to read? Should they have the ability to communicate? Should they have resolved their issues with anger? Restorative Justice is cheaper, more effective, more humane, and reduces future crime levels. I don't expect this type of facility to happen in American anytime soon. With the privatization of our prisons we look at them as a way to make a profit. fascinating, thanks Henry for the article, and thanks Kat and Lorenn for the good work you are doing.